Any project’s biggest asset is usually it’s project team. Yet we often find it hard to fully engage and leverage the experience, knowledge, and expertise of our most important resource! In this edition of ProjectTalk find out how to capitalize on the power of SharePoint and PWA by turning your Project Site into insight! We’ll take a look at the various ways you can customize your Project Site to collect and manage important project details and get your team working on the same page for an exponential boost in team communications, productivity and business value! And we’ll take a look at using the power of templates to repeat your success! 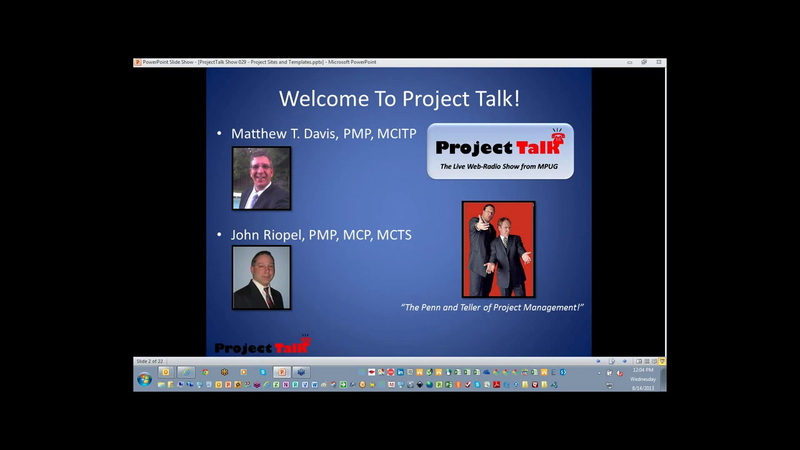 Join us for another edition of ProjectTalk with PM Providers’ Matt Davis and John Riopel on the MPUG Web-Radio Network! ProjectTalk is the live interactive web-radio show featuring real-time demonstrations of common project management and scheduling issues and how to address them using Microsoft Project and other tools. If you’d like to participate in the show, ask a question or offer a comment simply type it into the Q&A Tool, then raise your hand using the ‘raise your hand’ tool, and we’ll un-mute your mic so you can join the conversation! Just like talk radio! And anyone who participates live on the show will receive a stylish MPUG T-Shirt or other great prize!